1. Check your modem’s power cord connections. Your modem should be plugged in and all the indicator lights should be on. Ensure the power cord is securely connected to the back of your modem, as well as to the electrical outlet. If your modem’s power cord is connected to a power bar, try connecting the modem’s power cord directly to an electrical outlet on the wall instead. 2. Check that all your cables are securely connected. Verify that the coax cable connecting your TiVo PVR to the wall is securely connected at both ends. Also, check that the coax connection from your modem to the wall is secure. To do this, insert a straightened paperclip into the “reset” or “reboot” hole located on the back of the modem. Press the paperclip in for 3 seconds, then release. The modem will try to resynchronize with the Cogeco network, which can take up to 2 minutes. 4. Ensure there is no outage in your area. To do this, visit the Cogeco Reported Outages page. 5. Test your Internet connection using another device. Using your home computer or any other Internet-enabled device, try connecting to the Internet using your home network. Visit a website or connect to an online service. If your Internet connection is working on certain devices, the problem may be isolated to a particular device. However, if you aren’t able to get online with any device in your home, there may be an issue with your Internet service. 6. Restart your TiVo PVR. Confirm the box reset by pressing the thumbs down 👎 button 3 times, then pressing Enter. Your TiVo PVR will shut down for 3 to 5 minutes. If you’re unable to restart your TiVo PVR or any TiVo Minis from the TiVo menu, unplug your TiVo PVR and any TiVo Minis. Wait 10 seconds. Then, reconnect your TiVo PVR, followed by your TiVo Minis. 7. Test the Internet connection on your TiVo PVR. If the TiVo PVR displays an error message, consult our list of error codes. 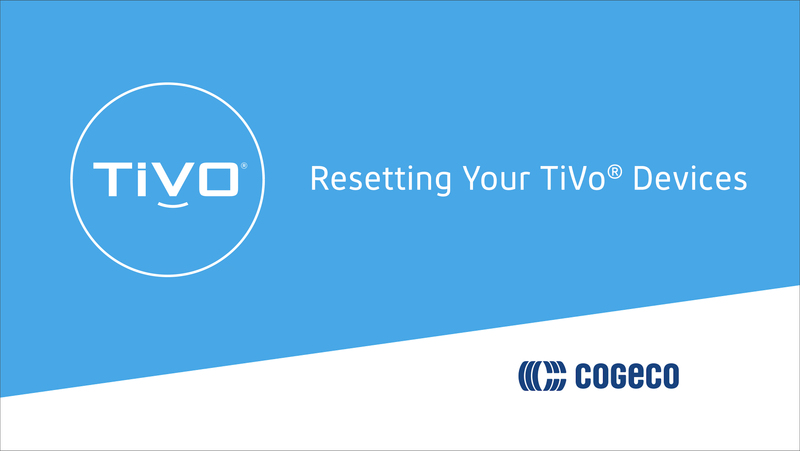 If you’ve followed all the steps above and your TiVo PVR still won’t connect to the network, please contact Cogeco technical support.